The aluminum angle spill berm is a quality containment barrier that has been used for the storage and containment of tanks, industrial equipment, drums, and other large vehicles and tankers. These berms offer increased flexibility and rigid walls that creates a firm structure around your entire unit. Standard sizing for these berms can include widths up to 15' and lengths up to 60'. *All berms come with standard aluminum angle brackets. If you are looking to store liquid in the berm that will reach 100% of the berm's capacity, ask about our heavy duty angle bracket options. 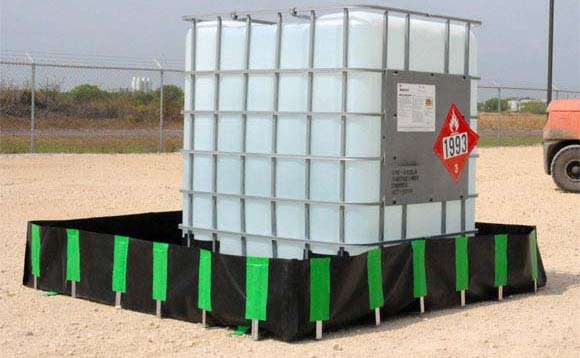 Spill berms are available with high resistance materials capable of handling a variety of hazardous liquids and materials including oil, chemicals, grease and more. When compared to other containment berms, these aluminum angle models are more commonly used for locations where stationary or long-term storage is involved. This can include use under stationary tanks, trucks, equipment and other machinery. As opposed to options like the foam wall model, these berms will all feature a standard wall height of one foot. This provides extra height to increase the volume and containment capacity of your berm.